Although the longevity of the world’s best rock trio (Sorry, Cream) has felt somehow self-evident for a long time, I have always remained quite impressed of how a band with Rush’s kind of volume in their back catalogue doesn’t have any bad albums in there. If you ask me, there are not even any fully mediocre ones. A personal hierarchy of sorts is relatively easy to form, but ultimately every one of their records has something killer on them. 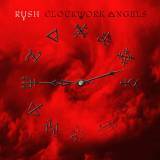 As the band released their 20th studio offering, Clockwork Angels, this consistency is very much intact and then some. I’ve read many pieces and forum posts that feel this is Rush’s best full work since Moving Pictures. I like Power Windows so much that I may not go that far. Best one since Roll The Bones? Definitely. Best one since Presto? Maybe even that. Thematically, they’ve returned to the concept-drenched vibes of their glorious 70s era. The story within has all sorts of bits and bobs about a young man’s growth and journey through a steampunk future with flying ships, alchemist-priests and the almighty Watchmaker who rigidly keeps everything in this futuristic world in check. The accompanying novel written by Kevin J. Anderson is apparently on its way. Musically however, nostalgia doesn’t rule the day despite some oldie-references in a tune or two. The modernized heavy rock sound of Rush has gotten a notable prog injection compared to recent times, though. The three-part title track blasts a sweet rhythmic playground onto our faces. Caravan and BU2B scorch onwards as probably the heaviest Rush-tunes I’ve ever observed. Impressive riffage. The string section that spices up golden ones like The Anarchist and The Wreckers adds very nice melodic flourishes to the aural pictures within. If you think that these veterans can’t speed it up anymore for some rapid rocking, think again as Headlong Flight bashes yer head in. The Garden is a brilliant epic ballad that closes the record. The mid-tempo Wish Them Well is about the only track that I can’t seriously get behind, even though it has its moments as well. Call it another one that is simply diminished by the superior tracks around it. The production job is flawless throughout with Geddy Lee’s bass receiving extra oomph which I love. His voice may end up straining on several parts that this record has if played live but man, he sounds as good as ever on record. Alex Lifeson revs up the riffs and mellow arpeggios with equal gusto and Neil Peart is Neil Peart. Seriously, should I try to convince you about the performance factors of a Rush-album? Didn’t think so. Overall, I’d say Clockwork Angels displays men on a mission. It feels like Rush plays with a renewed sense of purpose. Vapor Trails and Snakes & Arrows were both good discs, but they had some filler in their ranks for sure. Here, that kind of mediocrity simply refuses to be unearthed. All glory to Rush!